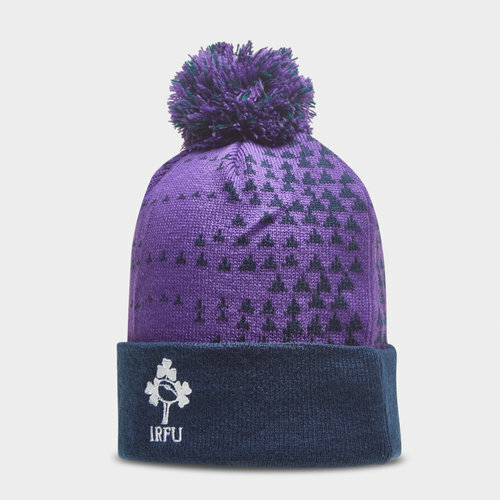 Cheer on Ireland at this year's Rugby World cup when you're out and about, in training or at the Aviva Stadium, make sure you look your best in this Ireland 2019/20 Acrylic Rugby Bobble Hat from Canterbury. The international rugby team Ireland are ranked second in the world by World Rugby as of 19 November 2018. The team competes annually in the current Six Nations Championship, which they have won fourteen times outright and shared nine times in its various formats. The team also competes every four years in the Rugby World Cup, where they reached the quarter-final stage in all but two competitions (1999 and 2007). They have linked up with Canterbury for a second time, since 2014 this time, a partnership that looks strong. The two have collaborated to bring out a 2019/20 match and training collection. Made from 100% acrylic knit this beanie has a fleece band that wraps around the inside to cover your forehead and ears while the knitted effect of the beanie helps retain the heat when tackling those chilly days and nights. This hat comes with a navy and purple design. The Irish Shamrock is embroidered on the front with the Canterbury CCC logo on the back and the team's sponsor - O2 - also seen.